Deborah: I really can't believe that it took me so long to think of this, it's the perfect combination!Jennifer: The cream cheese is the best part!Piealamona: You're welcome! And I agree, this is perfect to send to the office!Curt: I know, I really didn't talk enough about the cream cheese! In fact, the whole reason I dreamed this up was because I had extra cream cheese frosting leftover from the Red Velvet Cake I made recently. I couldn't let the frosting go to waste and I can only eat so much by the spoonful starting to feel sick! I was going to make some banana muffins and frost them but some friends and I were talking about Pumpkin Roll the other night and the next day a lightbulb went off!Mike: I think Nutella would be AWESOME in this! What a great idea! Sara: Three euros a slice! Ouch! We don't have any American bakeries down here except for one I know of on the other side of the island. But we do have our American grocery store on base so I can buy ingredients for just about anything I crave. But with all the yummy pasticcerie around, I don't miss American bakeries too much :-)Brilynn: Why not make one of each? :-)Manggy: I saw that recipe when I was trying to figure out who else was making banana rolls. Her cake is a butter cake rather than sponge and even though she says it can be rolled, I'm still be a little nervous to try it! But since I actually like butter cake better than sponge cake, I think I will try it sometime. I was thinking that her version would be especially good with the Nutella filling that Kevin mentioned!Carla: I usually do the same thing. About as adventurous as I ever used to get with ripe bananas was making banana muffins instead of a loaf of banana bread! It was fun to try something new although my banana muffins are much healthier than this cake! What a good invention! 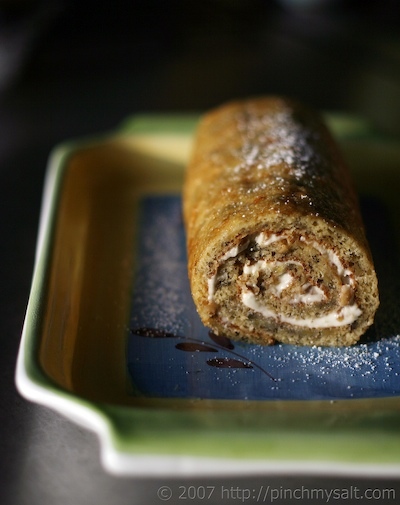 I've never seen a recipe for a banana roll before and I have no idea why -- it's a sensational idea. I also like the OP's idea of a nutella filling too. Tish Boyle has a recipe for a banana walnut cake that's served with a caramel mascarpone whipped cream which I think would be another great filling for this.Also, thanks for the link to my blog. Candy: This cake actually rolls surprisingly well! It's a sponge cake and they are more pliable than butter cakes. Also it's really thin! Rolling it while warm and letting it cool in the towel makes it easier to roll back up again after filling it. It really does work!Tony: I tried it with walnuts and it was really good! This is an amazing recipe ! I've done it over and over and its easily adaptable, esp for extra healthy! and super simple I just pick a blend of types of flours [soy & wheat] and use spenda baking blend instead of sugar, egg whites, and for the spread i use fat free cream cheese, use applesauce instead of butter, add some cinnamon and it's 105% amazingThanks so much for this recipe! Your website is wonderful :)and I really admire you !